Energy Fabrication’s 600 HP pump trucks deliver the most horsepower available while still maintaining a high level of safety. All 600 horsepower pump trucks, whether body load or tractor trailer, are fitted with high pressure kill systems to provide superior control and reliability. At EnergyFab we utilize the most reliable and cost effective components to achieve longevity and low maintenance. We can produce the maximum achievable fluid horsepower with the engine package selected and all our equipment is tested to maximum design flows and pressures. 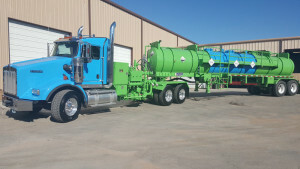 Call us today at 800-946-8645 if you need a pump truck for your job. Computer Job Tracking Available in ERAD, Mobile Data Tech, RapidLogger, Totco And Others.